The 2008 anime movie is coming to high-definition in October. In an early announcement to retailers, Warner Brothers says 'Naruto Shippūden 2: Bonds' will have a Blu-ray release on October 25. The Blu-ray will feature 1080p video, a Dolby Digital 5.1 soundtrack, and supplements include production sketches and a music video. 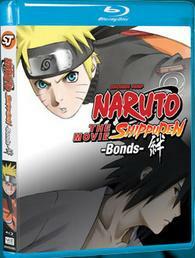 You can find the latest specs for 'Naruto Shippūden 2: Bonds' linked from our Blu-ray Release Schedule, where it is indexed under October 25.